From the moment current US Ambassador to the United Nations Susan Rice withdrew her name from consideration to be President Barack Obama’s next Secretary of State, politicos in Boston and beyond have had plenty to gossip about. With Rice – whose putative nomination was effectively scuppered by opposition from key Senate Republicans – out of the picture, most observers presumed that John Kerry, the senior US Senator from Massachusetts and 2004 Democratic presidential nominee, would be President Obama’s pick. 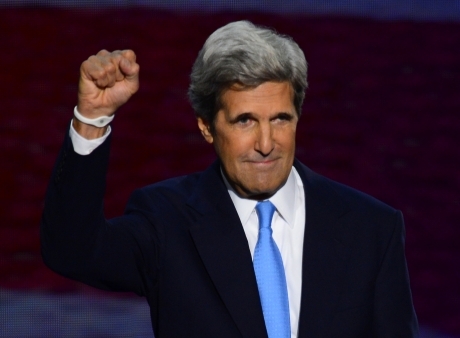 They were correct, and it is likely that John Kerry will soon be confirmed to the key diplomatic post. Meanwhile, back in Massachusetts, the political rumor mill began churning almost immediately. By law, a special election must be called within 160 days of a US Senator’s departure from office. Another law, enacted on the death of Senator Edward Kennedy to ensure that Massachusetts would be fully represented during the debate over health care reform, provides that the governor can appoint a temporary replacement to serve during that time frame. The law with respect to succession in the US Senate has been tweaked on more than once occasion over the past several years by the overwhelmingly Democratic state legislature for unashamedly political reasons. A number of rumors and names of potential successors have circulated in recent weeks. One early rumor had it that the state legislature would change the law yet again and that Governor Deval Patrick would appoint someone to serve out the remainder of Senator Kerry’s term, which ends in 2014. The rumor derived from the fact that the state legislature probably could have done so with little or no political repercussions, given that the electorate is already suffering from severe campaign and election fatigue. The legislative leadership, however, declined to revisit the law. There have also been a number of names floated as potential temporary appointees. Vicki Kennedy, Senator Kennedy’s widow, is one. Former Massachusetts governor and 1988 Democratic presidential nominee Michael Dukakis is a second. Just retired former Congressman Barney Frank, who has openly declared his interest in being appointed, is a third. Governor Patrick has not given any inkling of who he will appoint temporarily, other than to say that he definitely would prefer someone who will not run for the seat. As far as those who do intend to run for the seat, there is only one officially declared candidate, Democratic Congressman Ed Markey. Congressman Markey, the dean of the Massachusetts congressional delegation, was first elected in 1976 and has been in Washington, DC ever since. Long-time political observers will recall that he was elected to Congress after triumphing narrowly in a very crowded and bruising Democratic primary in which his campaign slogan was: “You can tell Ed Markey where to sit, but you can’t tell him where to stand!” This was a reference to Markey’s banishment to a bleak State House hallway after he dared to cross then House Speaker, Tom McGee, who ruled with an iron fist. Congressman Markey has become well-known as a progressive crusader on Capitol Hill during his eighteen terms there. He has played leadership roles both on a number of key Democratic initiatives and in opposing Republican policies. Congressman Markey also parlayed his chairmanship of a committee overseeing the telecommunications and media industries to build a substantial campaign war chest that now exceeds $3 million. It’s clear that he is the favored candidate of the departing Senator Kerry, of Vicki Kennedy and of the Democratic Senatorial Campaign Committee. Indeed, this financial advantage and establishment support combined to help convince his colleague in the House of Representatives, Mike Capuano, that the race wasn’t worth his while. The only prominent Democrat who may still run and could deny Ed Markey an unobstructed path to the Democratic nomination is Congressman Steve Lynch, a proud Irish-American from South Boston. Congressman Lynch has a compelling life story to tell. Born and raised in public housing in Southie, he was an iron worker and union leader for many years, earned his college degree at night and ultimately graduated from Boston College Law School. He practiced law, served in the state legislature and was elected to Congress in a special election in 2001. Congressman Lynch is the most conservative member of the Massachusetts delegation. He opposes abortion and voted against President Obama’s health care reform legislation. His track record on the last two issues won’t help him in a “one on one” Democratic primary in Massachusetts against Ed Markey. Indeed, most observers felt Steve Lynch’s best chance at winning the nomination would have been in a crowded field of more liberal candidates. While there is a substantial constituency of traditional, predominantly Irish Catholic Democrats whose politics are much more closely aligned with Steve Lynch’s than with Ed Markey’s, these voters are far outnumbered by more liberal Democrats in Massachusetts in 2013. In this context, it’s difficult to see how Congressman Lynch could win, yet he does have a dedicated base of supporters and could benefit from being perceived as a stronger general election candidate. Moreover, a lot of Massachusetts Democrats resent the idea of a candidate being “anointed” the party standard bearer, especially by outsiders. That he is the “anointed” one would be just one of Congressman Markey’s several political weaknesses if he does become the Democratic nominee. Republicans have already begun to question when he last regularly lived in Massachusetts. Those “in the know,” even Democrats, concede that these critics have a point. He lives with his wife in Maryland and is apparently not often seen in his hometown, Malden, or in his congressional district. Moreover, he has been in Washington, DC for a very long time and may have a tough time convincing undecided and casual voters that he isn’t just a creature of Capitol Hill. He is not a battle-tested politician and hasn’t faced a serious campaign challenge since 1976, a totally different era. Lastly, he isn’t very well-known by ordinary Massachusetts residents outside his congressional district. Of course, all of the foregoing presumes that Scott Brown, who was defeated in November in his bid for a full term in the Senate by Elizabeth Warren, will be the Republican nominee. It’s hard to envisage a scenario in which he won’t be. The polls indicate that he remains very popular with Massachusetts voters – particularly with the moderates who could decide the outcome – and will be very difficult to beat. Although most people back in Massachusetts may understandably be suffering from campaign and election fatigue, this year promises to be another fascinating one for political junkies. And this column will certainly return to the question of who will succeed John Kerry in the US Senate between now and whenever the special election is held.